Grit is a very unique word. It is not used as much, but it's very similar to the words grind, hustle, persistence, never quitting and the sense of relentlessness. The question the author talks about is whether grit exists. Most successful people have a sense of grit, but what's nice is that the author talks about how to induce, foster, create the feeling or having the personality of grit. It's actually a combination of things, like passion and skills and the work behind it. The author talks about how in order to have grit, a person must love what they do and still aim to be better. I guess in a way it's passion mixed with mastery. Passion is doing what you love doing and there's not a whole lot of people who actually do what they love. So having the love gives you more of a chance to be gritty in anything that you do. The first step in having grit is fostering passion by being open to experiences and new things. That starts with a personal interest. The author talks about how there is a misconception that when you like something that you're immediately passionate about it and she talks about how it takes time to know whether your interest will become your passion. So it's interest, passion, and then mastery. Once you've spent time and years in a certain area, then there's part you that wants to excel and get deeper into that skill or that passion. And that allows a person to move forward, be resilient and keep going because there's a sense of growth in it. So it's never-ending and it's not just about not giving up. She's talking about not giving up on something that you love, but more in a positive way is by growing into loving what you do. I thought that was pretty interesting. I love the fact that your passion, what you love, is important and that will drive you further into it. People are moved by pain or pleasure, so I love how the author looks on the positive side, which is your passion that will push you further. 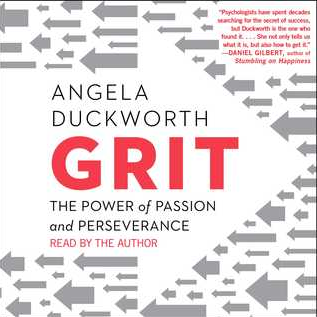 I recommend this book even if you don't have grit yet on what you're doing. It's a good guide to find your passion. And the author talks about a more realistic approach that starts with an interest. For anyone having a hard time figuring out their passion, allow yourself time to step back and look at what you're interested in. It could be multiple things at the same time, but it's the time that will allow you to recognize which one you are more passionate about. And focus on that and move forward.